In the framework of Financial Cooperation (FC) between the Kyrgyz Republic and Germany, the German Government has offered a financial contribution of EUR 4.0 million for a safe blood transfusion project. The project was awarded to EPOS Health Management in consortium with GOPA Consultants, Mediconsult and CAICO as national partner company. Key project team members - Dr. Günter Merk, Team Leader, Mihran Nazaretyan, Haematologist and Transfusion Expert, Ainagul Osmonova, National Project Co-ordinator and Susanne Wessel-Ellermann, EPOS Backstopper - conducted a first visit to Kyrgyzstan from June 04-11, 2011. Team members met with the Ministry of Health, KfW, and external support agencies to gather information on the blood transfusion sector and to align expectations towards the project. Extensive discussions were held with the director and deputy director of the Republican Blood Centre (RBC) and visits of the institution followed. Work included the preparation of an operational plan for the needs assessment during the inception phase. The overall project objective is to improve the quality and safety of blood transfusions and to increase the efficiency of the blood donation and transfusion system in Kyrgyzstan. Steps undertaken will be: 1) to rehabilitate selected blood banks; 2) to modernise blood bank equipment; 3) to establish a Quality Assurance system; 4) to include the development and achievement of rationalisation measures. The project is co-financed by the German Ministry of Economic Co-operation and Development (BMZ) and implemented by KfW. EPOS Health Management, together with MEDICONSULT, Malaysia, for equipment procurement and GOPA, a Germany consulting firm for civil works support the Project Executing Agency (MoH and RBC) in project implementation on behalf of KfW. The project term is 30 months. 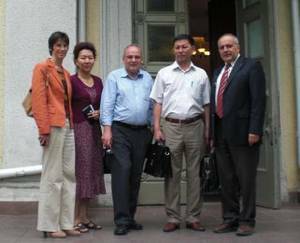 Pictured from left — Susanne Wessel-Ellermann, Ainagul Osmonova (EPOS National Project Co-ordinator), Günter Merk (EPOS Team Leader), Dr. Tursunbaev (Director of the Republican Blood Centre in Bishkek), Mihran Nazaretyan (EPOS Haematologist and Transfusion Specialist).